So. 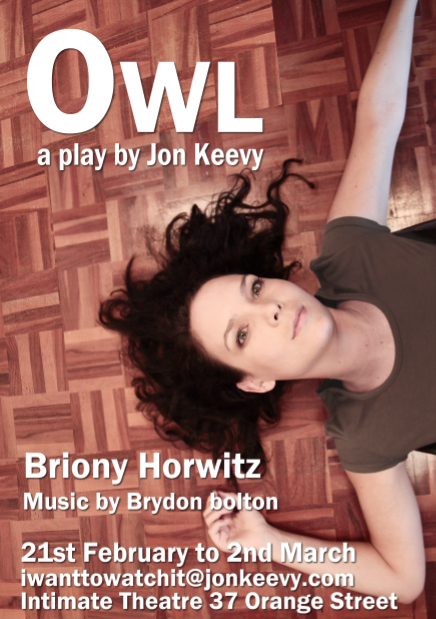 First draft of the poster for Owl (which is the play I spent 2011 writing and is my first directing experience in 5 years). Shot on Friday by Boniswa who was standing on a chair snugly fitted over Briony (you can still the legs on the right, I’ll have to sort that out). I’m going for what in my mind is a slightly retro feel, balancing warm wood and desaturation. Briony was very patient and fun during the during shoot (and just looks amazing too) – rehearsals have also been suspiciously easy. Maybe we’re just not working hard enough. We had a good get together with the entire team and got profile shots and Sanjin took video and interviewed us (once again I proved that I can say any number of reasonably intelligent things until there is a record device pointed at me). The email address is real but totally changeable. What do you think, fun or forgettable? I’ll be working on it more this week and should have a beautiful and completely different one in a couple of days. This entry was posted in Projects and tagged Boniswa Isaacs, Briony Horwitz, Brydon Bolton, Owl, Photography, Posters, Sanjin Muftic. Bookmark the permalink. Pretty cool, Mr Keevy. Dig the unsaturated vibe! Thank you, I am useless at proof-reading!